On May 30th, Google changed Google Places to Google+Local. What does that mean to you as a dentist? Hopefully, you understand what Google Places is/was, but let’s assume you don’t. Google Places was a section of the search world where your business showed up in a Google search–either on a Google map, in a browser, or on mobile phone local search. In that result will be information that Google gathered about your business: what type of business it is, the name, address and phone number. (You’re already there, if you know it or not.) But you as the business owner can add a great deal more information about your business: your hours, your services, promotions, photos, videos, your website address. All very good stuff for people to find. And you should have done it by now, but if you haven’t, it’s more important than ever with this new change. 2. It now boosts your SEO for your business and your website (which Google Places didn’t). 3. Reviews matter more than ever, and this is where they show up. 4. Search on mobile phones is exploding, meaning you need local listing with a lot of information. 5. Did I mention it’s free? 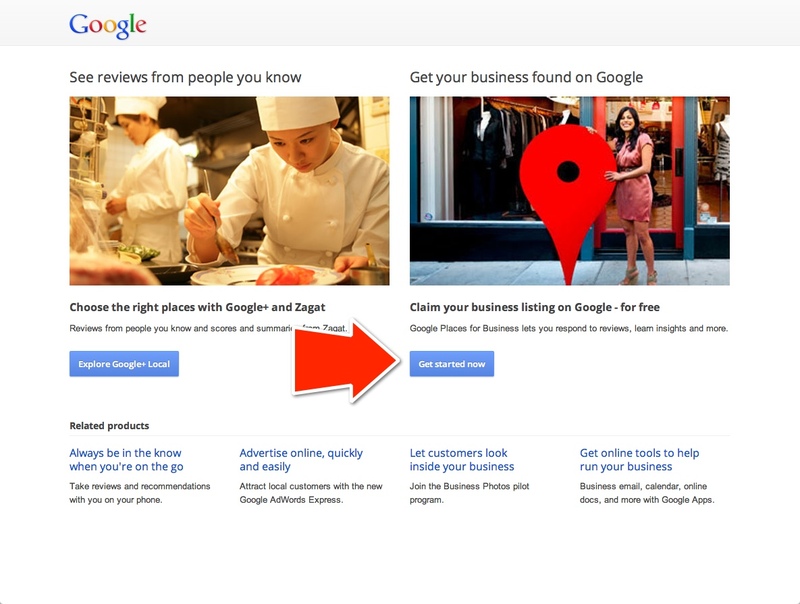 If you’ve already claimed your Google Places site, your practice will show now up in Google+Local, but looking very different. This is what my friend Craig Spodak’s site looks like. Notice his fine use of photos. So why the change? Because Google wants to vastly expand two areas: local business advertising and social media. Google+ is their social media equivalent to Facebook, but not a lot of people use it relative to Facebook’s daily activity. But now, with Google+Local, Google is combining the search result information from Google Places and Google+, and indexing it for SEO purposes. 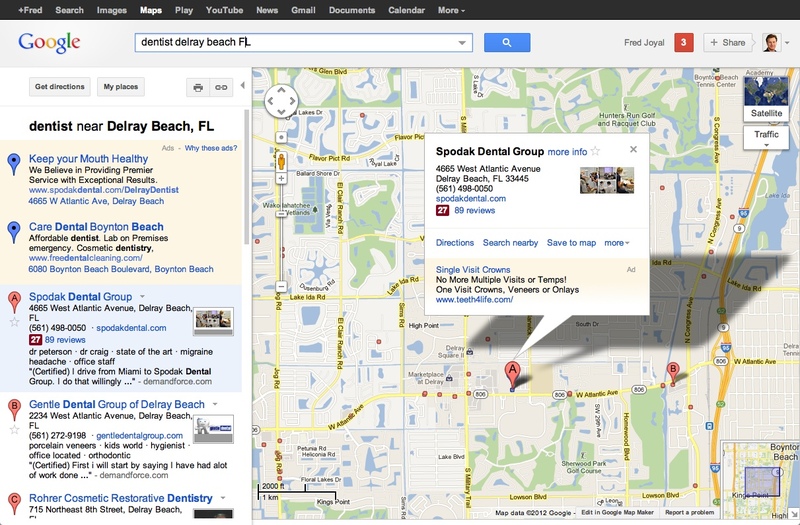 As I mentioned, this was not done previously, so doing Google Places did nothing for your own business SEO. But it also means that now the more activity–social activity–that you have, the more your practice will come up in organic search as well. So just as I recommend weekly activity on Facebook for your practice, you now need to have weekly activity and daily input and reviews from patients on Google+. That’s the bad news. The good news is the SEO, and the better look, and the fact that everything is happening in one place. And no doubt you will be able to do promotions on this as well, for $, of course. This will change and evolve over time, but Google wants into this space badly, so they are going to keep working it. Before, there were star ratings from one to five stars. Those are gone. Now there is a score, and the score is a bit confusing. The reason for the score is that last year Google bought Zagat, the travel review business, and it has now incorporated those Zagat reviews and ratings into Google+Local. This has nothing to do with dentistry, as we are not reviewed in Zagat, but the scoring shows up the same. It is a scale from 1 to 30. However, when someone reviews your practice on Google, they will rate it on a scale of 0 to 3, and then Google will multiply that by 10, and then average all the scores, just to make it uniform with all the Zagat scoring. Weird, and it probably will change, but for now that’s how it works. Your reviews will still show up, but it will be easier for people to write them, though they can still only write a review if they have a gmail address. But you need patient reviews! This is ever-growing in importance, and Google only presents reviews done on your Google Local site, not any other reviews from anywhere else. In a search now, Google will now not only look at the rating and reviews for your business, they will look at both the frequency and content of the various postings and social activity on your Local Page. Of course they are manipulating you to use Google+, but they are the big dogs, so we must play along. Now this result will appear in several places: if someone searches on Google Maps, or if they simply do a Google search, and also now if they search within Google+, where there is now a “local” tab on the left, as you can see in my Google+ page, where the blue arrow is pointing. The same results will occur on mobile phones for all three types of searches. (In June, Apple will launch its own mapping app so it won’t show up on iPhones unless someone uses a Google Map app or a Google+ app on their iPhone.) In a previous blog on smartphones I talked about how prolific and accelerated the use of search will be on mobile phones. This plays right into that. Once they click on it, then it will go to your Google Local page. First, you need to get your Google Places claimed and fully filled with information. 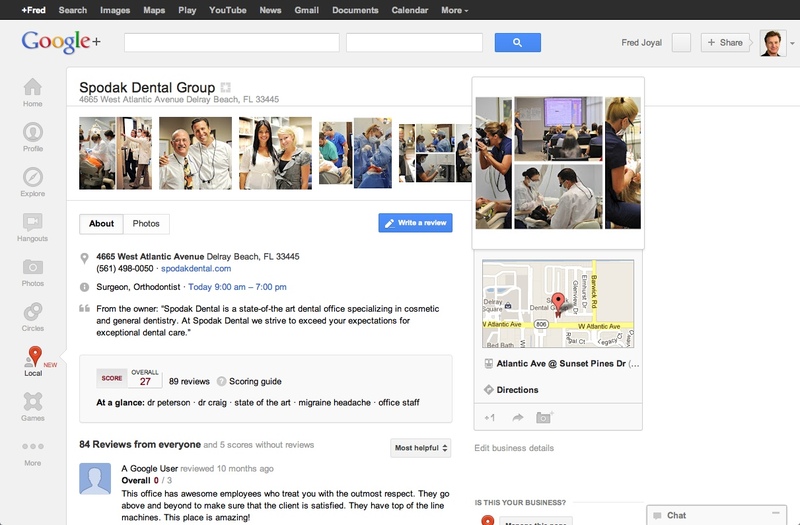 Second, elicit Google reviews from your patients on a regular basis. Third, have regular posting activity going on within your Local Page. Don’t spend a lot of time on this, but don’t spend none. Remember, this is not going to suddenly flood your practice with new patients, but it is going to make you easier to find, and easier to find out about. And that’s what millions of people will use it for. So don’t wait another day. You can add more photos and video as time goes on, but get started now. By the way, if you are a Patient Activator customer, we’ll walk you through every step of this just to make sure it’s exactly right. This entry was posted in Advertising, Dental Marketing, Dentistry, Online Reviews, Practice Management, Search, Social Media, Uncategorized, Websites and tagged advertising, dental marketing, dental practice marketing, Google, Online Reviews, social media, websites by Fred Joyal. Bookmark the permalink. Very nice and informative blog. Thank you Dave as always. Your book ,your blogs and your advise has truly changed my office for better.